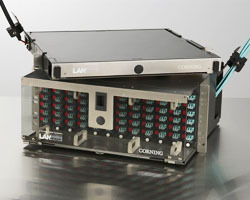 The Corning Cable Systems Closet Connector Housings (CCHs) provide interconnect or cross-connect capabilities between the outside plant, riser or distribution cables and the opto-electronics. The units are designed for rack mounting in 19 in (48 cm) racks or optional 23 in (58 cm) equipment racks (1.75-in EIA hole spacing). They are available in 1-rack-space (two panels), 2-rack-space (four panels), 3-rack-space (six panels), or 4-rack-space (12 panels) versions and designed with an open top at the front of the housing to facilitate jumper routing when used in conjunction with the closet jumper management panel.